Germany's Mario Götze was Man of the Match during the 2014 WorldCup final after scoring the only goal. Twitter will again host voting for the Man of the Match at the end of every game of the 2018 World Cup, which begins this week in Russia. 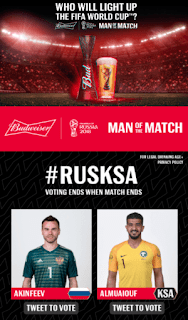 The Man of the Match ballot will include an enhanced visual portal and will be available in five languages: English, Spanish, French, German, and Portuguese. Winners will be announced through the official @FIFAWorldCup account with a highlight video and interview. Budweiser, Twitter, and FIFA began their partnership at the 2014 World Cup in Brazil, using Twitter as a polling place alongside FIFA’s website and app. More than four million total votes were submitted during that tournament. Twitter reported a record 672 million total World Cup tweets in 2014. Germany’s shocking 7-1 semifinal rout of Brazil racked up the most (35.6 million), slightly ahead of the Argentina-Germany final (32.1 million). The title game, however, set the record for the most tweets per minute (618,725) just as the match ended and Germany became the world champion.